Exactly the same as thousands of locations all across America. Not great but not terrible either. Kinda boring but decent enough to eat a couple of times a year. Right about the time you finish it you think to yourself, 'man, I could have had something much better' but then again you ARE full. When you are tired of Vietnamese cousine and you need bite some western styled pieces of meat and veggies, subway is decent choice. Price range is between 50k - 80k for 6 inch baguette and 110k - 130k for 12 inch. Baguettes are from grill, vegetables is fresh and it offers more than 10 customizable baguette styles. English speaking personal, Okey service. Quality slightly lower than Europe, but still good enough. This is a small shop, but offers a consistent expectation of a good sandwich and consistent menu from around the world. Its pretty dirty environment with it needing a really good deep clean, especially on the floors. The staff have been good on odd occasions, but not consistently, especially the importance of a smile, eye contact and a warm greeting is really important to deliver each and every time. You cannot go wrong with subway, its a healthy choice and tasty! 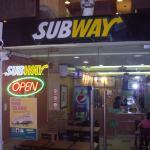 Been to Sub Way Sandwich? Share your experiences!